The America’s Cup is a race like no other. It started with a loop around the Isle of Wight way back in 1851, and a victory awarded to a crew from the USA with a schooner called America – hence the name. Thanks to modern materials and cutting edge technology, the 160-year-old race continues to evolve and currently resembles something akin to Formula 1 on water. It’s packed with plenty of tech ‘n’ gadget goodness, all wrapped up in a heady cocktail of carbon-fibre with five teams shortly hoping to beat current defenders Oracle Team USA over in Bermuda. What you get is a no-messing 20 minutes per race and, in that time, speeds on the water approaching 60 miles per hour. And that’s all without an engine. In fact, on the day that we hit the waves and chased after the Land Rover BAR craft, the rather fierce looking R1, in a RIB armed with twin 225 horsepower Yamaha outboards, we were hard pressed to keep up with this technological masterpiece. The craft is as much a flying machine as boat, while the acceleration once the wind takes it is instant and almost surreal to watch. The effect is compounded by the fact that there’s no noise, so it’s kind of like a Formula E car on water, with cornering to match. All you do get is this slightly unnerving, ghost-like whine as the wind whistles through the bracing cables called the ‘rig’ that helps hold the 23.5 metre high wingsail up. All six of the competition craft are identical AC45F foiling catamarans that are manufactured in New Zealand and boy, do they move. One minute the R1 potters along as the crew make some adjustments and the next, it’s gone, cutting across the bay like a knife through butter. So, just how do you control a beast like this on the water, in conditions that are susceptible to constant change? Well, central to this, aside from the multi-skilled six-man crew headed up by Sir Ben Ainslie, is the wheel. This isn’t conventional in any sense, save for the fact that it’s round. Manufactured from carbon-fibre, the circular design is the culmination of months of R&D work, along with on and off the water testing, both back at the team headquarters in Portsmouth and in Bermuda, which is hosting the event this time around. Cleverly, the wheel fuses technology from Land Rover’s new Discovery and blends that with Sir Ben Ainslie’s own custom operating requirements in order to squeeze more performance from the R1. 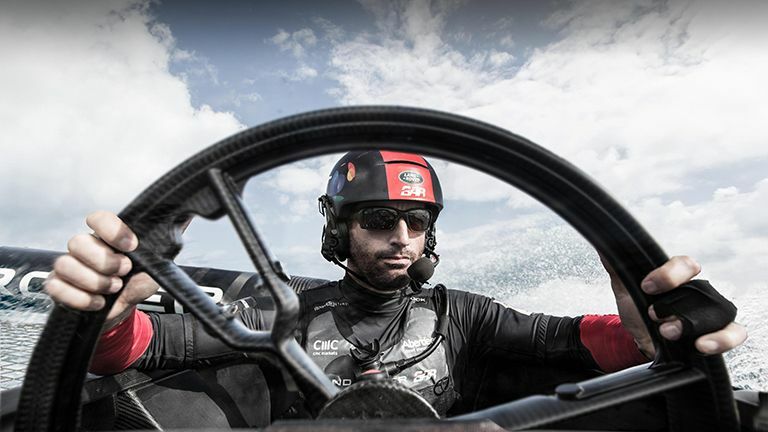 There are gear-shift paddles that have been crafted to suit his hands, and this pinpoint precise control allows him to effectively ‘fly’ the craft across the water on knife-like hydrofoils. While the wheel helps steer the R1 left and right, gear shift paddles built in to the design allow for more, or less, lift above the waves. This is no mean feat considering the R1 weighs 2.4 tonnes, so it’s little wonder that the development period covered eighteen months, with fine-tuning still taking place in the run up to the race. The competition begins on the 26th of May, with the Land Rover BAR team up against Artemis Racing of Sweden for the first race. As with any sporting event and fiercely competitive entrants, the teams do their best to hide any new tweaks or performance developments. However, the rules don’t allow boats to be covered up on the quayside and, it seems, spies are everywhere trying to spot anything that might give rivals the upper hand come race day. Meanwhile, out on the water, it’s a game of cat and mouse, with spy boats chasing competitor craft in a bid to capture anything different that might deliver an advantage. In the case of developing the R1, engineers from Land Rover focused on three key areas. First up they targeted aerodynamics and performance, homing in on the core elements - the imposing wing sail and the daggerboards that slice through the water. Secondly, hugely sophisticated on-board control systems have been developed to ensure optimum performance and complement the carbon-fibre hardware. Thirdly, machine learning using artificial intelligence has helped bring all of the factors together. It has also produced huge amounts of data, with some staggering facts and figures on show. For example, the team spent two years logging data from a total of 350 on-board unique data points dotted around the R1. Each time the craft took to the water, no less than 189 million data points were collected, and the process has so far produced 378 Terabyte’s of data and counting. There’s an on-site communications centre back on the quayside that lets the boffins in Bermuda monitor progress on the boat. At the same time, every bit of data that’s captured during training sessions is piped back to the team headquarters in Portsmouth where data analysts pick through every peak and trough looking for ways to improve performance. The team camp, meanwhile, is a neat array of containers and covered areas on the dockside. There’s a gym, showers and enough food for the duration of their stay on site. However, while the R1 might be a masterpiece of design, engineering and innovation, it’s the crew that really make things happen. And, while Sir Ben Ainslie might be the skipper who’s armed with a wealth of experience and also has that very clever wheel at his disposal, you should spare a thought for the others on board. Perhaps the toughest crew role you see when these boats are in action is that of the ‘Grinders’. These guys are the main source of power for the boat and must manually generate all the pressure needed to operate the hydraulics that control the wing sail and daggerboards. Whenever it’s needed they work furiously to build up enough fluid pressure to carry out the next required manoeuvre and it’s mad to watch. You can easily spot a Grinder due to their upper body size and pneumatic biceps. It’s this aspect of the America’s Cup that reminds you how slightly bonkers sports oldest international competition really is, but there are plenty of other quirks associated with the event that make it even more compelling. One key point is the way the winner gets to decide where the next competition should be held. The Land Rover BAR team look to be in great shape for the race too, with a two point lead over the rest of the challengers. So, when it kicks off at the end of May be sure to tune in and, hopefully, we’ll get to see the team finally bring this prestigious sporting trophy to Britain.